CPS Camp No. 80, Lyons New Jersey. 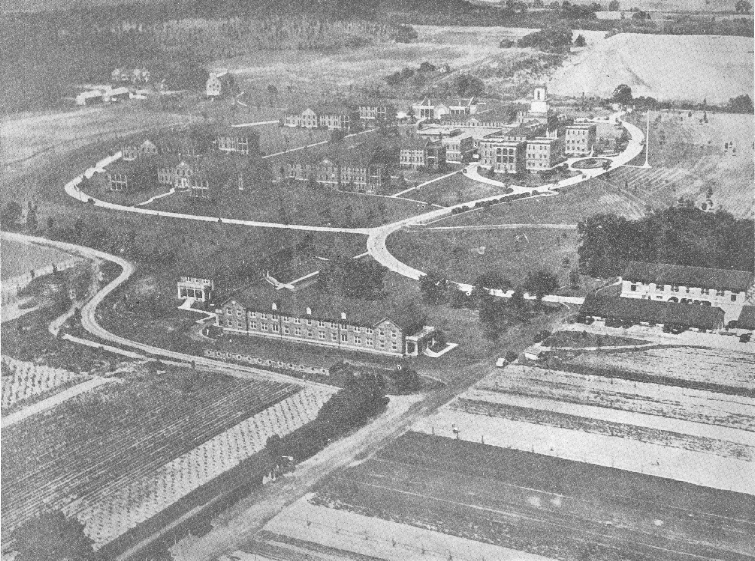 Aerial view of Lyons Veterans Hospital; 1940. Donated by Philip A. Orpurt. "CO's and Mental Health: An Assignment Unfinished"
CPS Unit No. 80, a Mental Hospital unit located at Veterans Administration Hospital in Lyons, New Jersey operated by the Brethren Service Committee, opened in April 1943 and closed in August 1946. The majority of the men served as ward attendants. Of the men serving at Lyons, the majority were married. At one point, of the twenty-four men in the unit, fifteen were married. In the early months, five of the wives worked at the hospital for pay, since they were not subject to Selective Service regulations. Men at the Brethren Service Committee camps and units tended to report a mix of Brethren and non-Brethren denominational affiliations when entering CPS. The majority of the men served as ward attendants, although some also served in clerical, agricultural, maintenance and construction, motor vehicle operation, technical and professional as well as food preparation roles. For a brief time four married couples lived in a farmhouse on the grounds of the hospital. However, a flurry of criticism in local newspapers caused hospital administrators to order the men to move back into the dormitories and restricted them to “brief visits” with their wives at the farmhouse in public quarters. Frances Clayton recalled “Well, we abided [by the rules], believe me, and as a result I don’t think there were any babies made at that time” (Goossen p. 58). The Veterans of Foreign Wars (VFW) took exception to any privileges afforded to COs. In fact, the New Jersey branch of VFW passed a resolution condemning “colonization” of the CPS unit at Veterans Administration Hospital in Lyons. Selective Service, in response to complaints about assignees working off hours, issued a directive requiring superintendents to give permission to assignees for off-site work in their off-duty hours. At Lyons, the acting hospital director Homer Rogers took the directive seriously and specified that nineteen COs were approved to work from six to twenty hours per week in fields he specified . . .as long as employment would not interfere with their hospital duties. After the unit had been established for a time, camp administrators representing church committees recruited for additional men at the Veterans Hospital. One such brochure, 25 Men Needed at Lyons, candidly described the unit living and working conditions. A federal investigator did appear at the hospital to take sworn depositions from everyone named in the document, heightening tensions between unit men and regular attendants. In the summer of 1945 the men conducted a relief drive raising $178 to buy heifers for the Church of the Brethren Heifers-for-Relief program. In December of the same year, the men raised $276 to purchase dried milk for European relief. Beginning in January 1944, the men produced Bridge, a paper which continued for part of the year. From March 1945 through July 1946, the men published a unit newspaper called This Week. For information on Brethren mental health and training school units see Leslie Eisan, Pathways of Peace: A History of the Civilian Public Service Program Administered by the Brethren Service Committee. Elgin, IL: Brethren Publishing House, 1948, Chapter 6, pp. 205-238. Swarthmore College Peace Collection CPS, Camp periodicals database. For more in depth treatment of the mental health and training school units, see Steven J. Taylor, Acts of Conscience: World War II, Mental Institutions, and Religious Objectors. Syracuse, NY: Syracuse University Press, 2009.